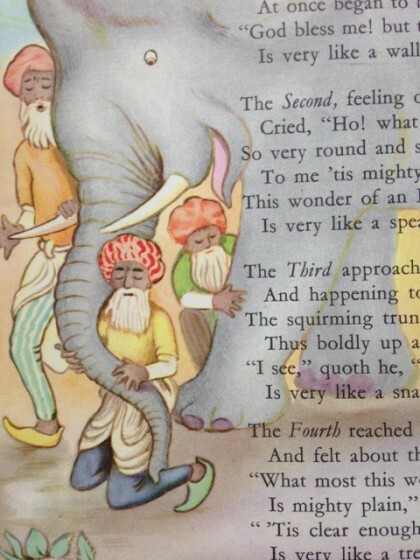 I was introduced to the well-known Hindu fable The Blind Men and the Elephant at a very early age. At 3, my mother read me the 19th century version byJohn Godfrey Saxe from the pages of the Childcraft volume, Storytelling and Other Poems. This volume was part of a set my parents must have purchased when they knew they were expecting me, because I can’t remember a time it was not on the bottom shelves of the hallway bookcase, ready to be pulled out and looked at whenever the fancy struck me. In fact I still have 4 of the volumes, some of their pages torn and taped, so I was able to snap this photo from the pages I wondered about when I was 3 and 4. Even though I am fully sighted, I often miss the whole picture of my progress. It’s simply too vast and too slow for me to appreciate. And often, like all of us, I get caught up in coping with the stress of the moment, and only notice that I am stressed, and not how I’m handling the stress way more easily than I used to. Selling a house and moving to another state is a big undertaking. Often I awake with a list of things I need to do to keep things in motion, wondering how I’ll continue to cope with everything up in the air. If I let them, these concerns could tighten my muscles up into knots. That’s why it’s really important for me to stick to a trick I learned a few years ago from a College Greens Engine 2 ost about doing some exercising at the beginning of the day, before anything else creeps in and takes over. I know I’ve written about my practice of sun salutation each morning as a way of stretching and getting myself focused in my body and grateful the sun is shining on our beautiful planet for yet another day. And how before I even get up out of bed, I say the beginning of a Hindu prayer that goes “Bless this day!! For it is life, the very life of life!” Then I tell Romeo we’re going to have another good day together. He knows when he hears me say these things out loud that I am about to do my series of healthy back stretches before I even sit up, and he often graciously obliges me by moving back over to “his” side of the bed. I’ve been stumped as to how to describe this series, or if it even has a Sanskrit name. My teacher simply called it the healthy back series, and she had us doing it before inverted poses of any kind. I find if I’ve done these stretches and twists before I even get out of bed, my sun salutations and other yoga poses –and everything else I do in the morning–goes much more smoothly. For our purposes here, we’ll stick to the very first movement in the series, which is to raise the right leg straight up while the left one is bent at the knee, and to reach with the arms as far as you can to grab on the extended leg. (This can also be accomplished by using a tie, which, for years, was the only way I could do it.) Especially first thing in the morning, the first grasp finds me at my right calf. 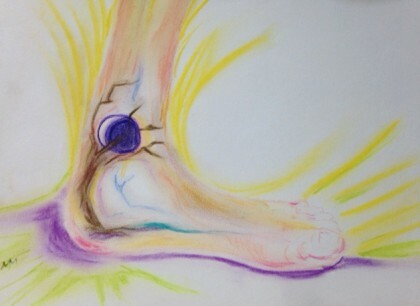 A couple more breaths in and out and I’ll be able to extend the stretch in my leg and arms enough that my hands can grasp the sole of my foot. The stretch to the back of the leg is delicious. But several weeks ago, in the midst of so much going on, before I even got to the point of stretching my arms and hands all the way to the sole of my right foot, something astounding happened. I’ll call it “The Blind Men and the Elephant” effect. As I placed my hands around my right calf, I gasped. I didn’t recognize it. What was this? Whose was this? A calf with a right calf muscle? This could not be mine, or be part of me. But it was. Because of the mild hemiplegia from the cerebral palsy I was born with, I’ve never had much of a calf muscle on my right leg. To be honest, it was pretty much straight up and down the first 40 years or so of my life. During my 40s when I took therapeutic horseback riding, the need to hang on with the legs to the side of the horse produced a slight definition between the bone and back muscle that I never remember feeling before. It wasn’t really until I changed to eating very low fat whole plant foods that I gradually noticed more definition in that muscle. It will always be smaller than the left one, which has compensated for it all my life. But apparently all the walking I’ve been able to do in the last 7 years (with a respectful nod to my more recent ability to walk up and down the Jefferson Street hill to the library) and consistently doing my yoga each day has added enough bulk that it startled me into non-recognition. It wasn’t as thick as the leg mistaken for a tree trunk in the fable, to be sure, but I’d never felt myself have such muscular bulk on the side I’ve always known, as weaker, smaller, and, just in general, more ephemeral. The feel of my muscle also startled me out of my worries about whether I was handling the prospect of this transition well enough. It demonstrated to me that all this while, I have been growing more solid, more present, and that I will have the stamina to go the distance. There will be hills and valleys, and times of treacherous overstimulation, but apparently I literally have the “muscle” to carry me over and through it all. In some ways, the parts of me that are used to a life-long physical challenge are like the blind men in the fable who can’t feel their present reality in its entirety. But in that moment my hands felt for all those parts of my selves, and the silence of doubt that followed was pregnant with possibilities and hope. In this most humble and tactile beginning of my day, a single auspicious part gave me a flash of faith in the whole, sparking renewed wonder at my slow motion miracle. Your words are so beautiful Maria. I am always inspired by the way you live your life in such gratitude! What a pleasant surprise to get your focus elsewhere! Congratulations on all the slow-motion miracles – something to keep you moving forward. And I’m keeping my fingers crossed for the house sale and move! I think fate brought me across your blog today – what beautiful words. Thank you for sharing. You’re welcome, Nic–very happy to hear this! Hi Maria, as always, thanks for sharing! I’m delighted with your progress, and I appreciate your reminder-by-example to be thankful for one’s blessings every day upon awakening. Too often, I’m assailed with worries, or my to-do list, to stop and remember the miracle that is life, the precious gift we each receive every day. Thanks for being my bell of mindfulness. And good luck getting your house ready to go on the market! This is so beautiful, Maria. I think we often become stronger (physically and in other ways) when we’re not looking — the moments when we’re trying desperately to summon up strength are often the ones in which strength feels hard to come by. I, too, have grown so much stronger through the repetitive motions of my yoga practice, which in spite of their quotidien nature (I wake up to sun salutations, as you do), are a little different each day. I may need to use your idea of vocally greeting the day. What a special thing to do. I am so glad that you could bear witness to this moment of your own physical transformation, and share it so eloquently with us. Maria – I always love that my dog awakens with such joy. I think she must saying “Bless this day!! For it is life, the very life of life!”. Now I will say it out loud as well. And best of luck with the move. I am so happy for you to be moving by your son.